The photo id for this photograph is 120, in the People album. 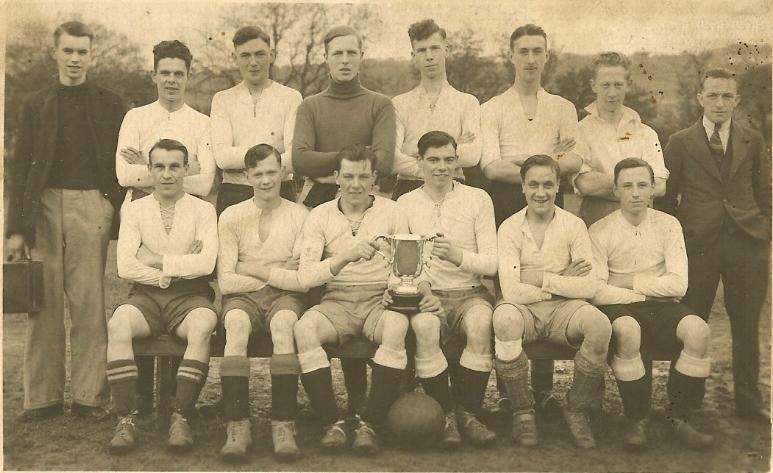 Footballer on right-hand side of back row is Bill Brooks, late of Wharf Road. It is very nice to see you commenting on here. Why don't you join up and I can send you a PM (private message). You may know me quite well from long ago. The player front row, second from right is Adam Cooper, my father. He lived on Chapel Road. Judging by the comments left on here from people I know my bet would be that this is the Horwich End Football Club. Horwich End played their home games at The Orchard which was on lane later acquired by the Botany bleach works. The pitch was just about where the bale sheds were in the old number 1 department. Whaley Bridge played at Hog's Yard; now the corner shop known as Tesco. I have a very interesting document, though unsigned and which does not give the author's name, about some early struggles for the football clubs. I'll put it on the general forum when I next have time.